Speaker maker Sonos aims to continue its push into the future of home technology and the company is looking to its past as a way to do it. On the heels of its recent IPO, Sonos is unveiling a new product as well as upcoming software changes — including opening its platform to developers — to try to fit the lifestyle of the consumer and enthusiast alike. 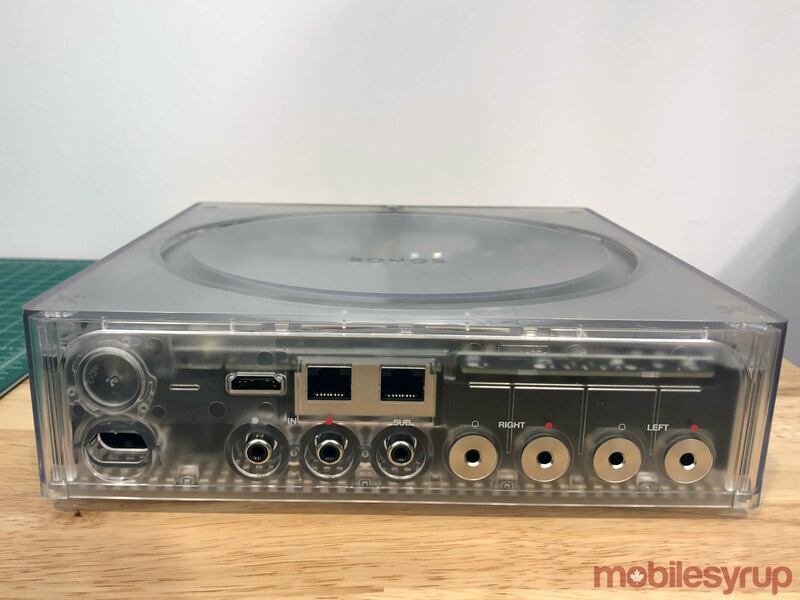 Called the Sonos Amp, the new product is a direct descendant of the ZP100 amplifier, originally released in 2005 as one of the company’s very first products. The ZP100 later got a slight bump up with the Connect:Amp, a product largely untouched in nearly a decade. The new Sonos Amp was shown to a small group of journalists, including MobileSyrup, last week at the company’s Boston office. After two years of extensive research and development, the company is lifting the veil just in time for a planned major presence at CEDIA Expo — a large home tech pro show happening next week in San Diego. 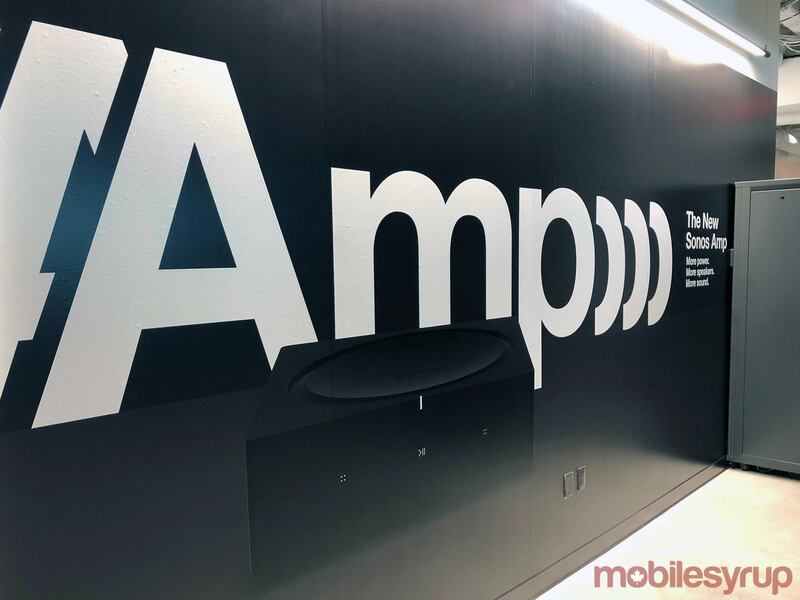 “The current Connect:Amp has been on the market for over a decade and it has served many users well,” said Benji Rappoport, a hardware product manager at Sonos that headed up the development of the new Amp, to the small group of media. The Sonos Amp will be available in December for $799 CAD to install partners and on Sonos’ website, with a wide release coming in February 2019. 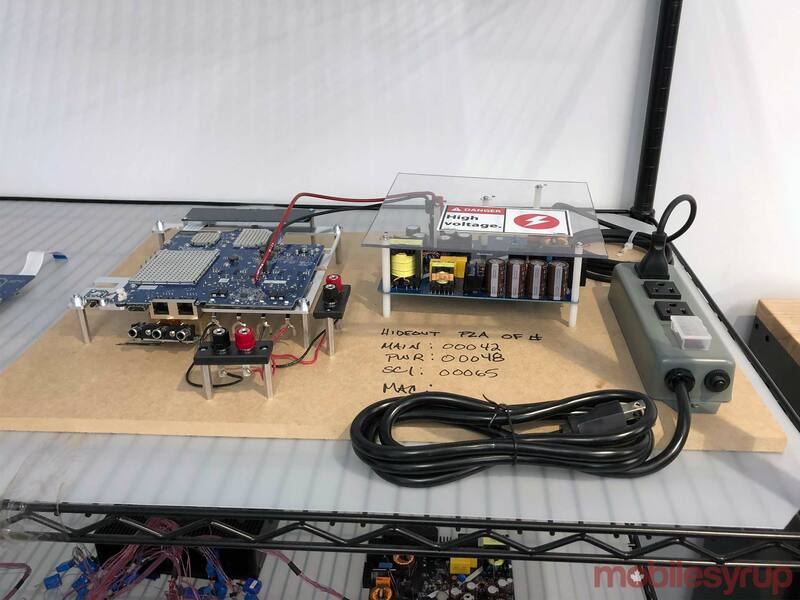 With Amp, the company is focusing heavily on its large custom install builder community to understand its needs for getting more power to more speakers with a cleaner design and modern technology. The Sonos Amp is designed with racks, stacking and stability in mind. It’s about 6.7cm tall and passively cools itself without any fans. It can now handle four speakers instead of the two in the Sonos’ previous amp offerings, with 125 watts a channel into 8 Ohm. Peak output current is 31 amps with a signal-to-noise ratio of 116dB. The back has an HDMI ARC connection with removable binding posts that can be replaced with standard banana plugs. There is a subwoofer output that you can now control the crossover frequency between 50 and 110Hz, whereas before it was fixed to 80Hz. There is still an analog input as well, plus two ethernet ports that will now disable Wi-Fi automatically when something is plugged in (auto-disable is rolling out to other Sonos products, too). Sonos is also keeping in an infrared receiver, but it’s wrapped around the bottom for easy repeater placement. Software wise, the Sonos Amp is getting dual mono plus volume limiting — a software feature that will be rolling out to other Sonos products — that allows you to have a second volume slider in the app to set a peak max volume, in case you don’t want to disturb neighbours or children. “Listening to the customer and industry feedback, we’ve incorporated it into something that we think really is a meaningful upgrade and change to the experience,” said Ryan Taylor, Sonos’ director of business development, in an interview. The new Sonos Amp essentially marks the first time the company will be replacing a product, albeit a decade later. The company’s strategy has never been to increase revenue through forcing customers to buy smaller iterations, like many tech hardware companies do, but instead the hope that people will keep expanding their Sonos collection by adding more speakers to the home. This means keeping the older models relevant for as long as it possibly can, the company said. Even the Connect:Amp will continue to get software updates after the new Amp comes out. “The default point of view is that everything should always get everything, unless it can’t,” Taylor said. “Keeping the hardware fresh enough to keep up with all of the modern software improvements (such as voice control or APIs) has been a shift,” added Zack Kramer, Sonos’ global head of retail and commercial installed solutions. The Amp is clearly aimed with home technology professionals in mind. The company announced new ways to receive direct feedback quickly from the professional community to understand what needs there are — both in design and features — then ultimately passing down the benefits to the homeowner that hires a custom builder to integrate everything. Sonos also announced a new partnership with Sonance, a company that specializes in speakers that are installed directly into the home. In early 2019 there will be co-branded in-ceiling, in-wall and outdoor speakers that will use Sonos’ Trueplay technology for better sound quality. “Now there is this piece of hardware (Amp) that’s this swiss army knife that you can use with so many different speakers, TVs and things in your home to get the best sound available,” Kramer said. The new Sonos Amp offers some compelling use case for not just professionals, but also for consumers and audiophiles who want to build a sound system for themselves. 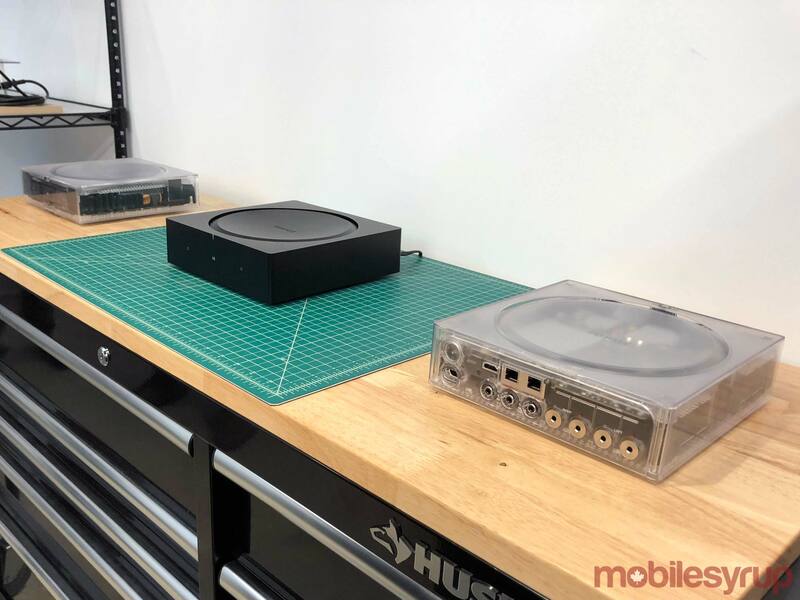 Media visiting the Sonos office in Boston was given a demo of a vinyl player with built-in pre-amp hooked up to the company’s upcoming Amp, then connected through speaker wire to a pair of large floor speakers. There was also a second Sonos Amp in the mix that was hooked up to rear ceiling speakers and a Sonos subwoofer to demo some action scenes on a big screen TV. The Sonos Amp, thanks to its increased power, could pump out an impressive amount of sound that gave the speakers a wide amount of range without clipping or distortion, plus you could hear the small details more clearly in both the movies and the music. 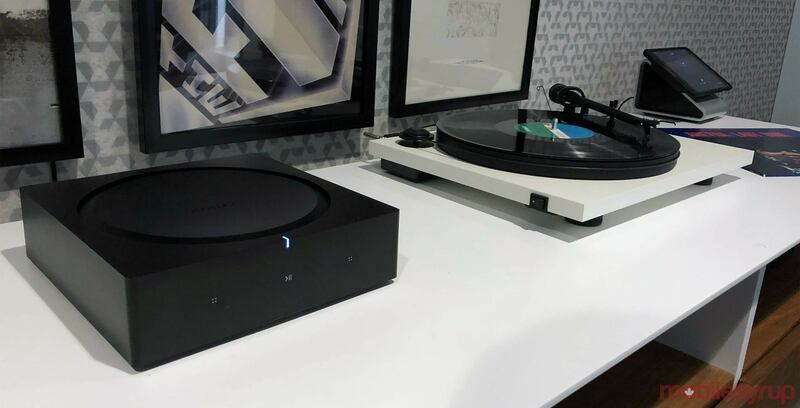 “There are pretty good use cases around this becoming a replacement for the traditional old way of doing amplified sound for a turntable,” Taylor said. 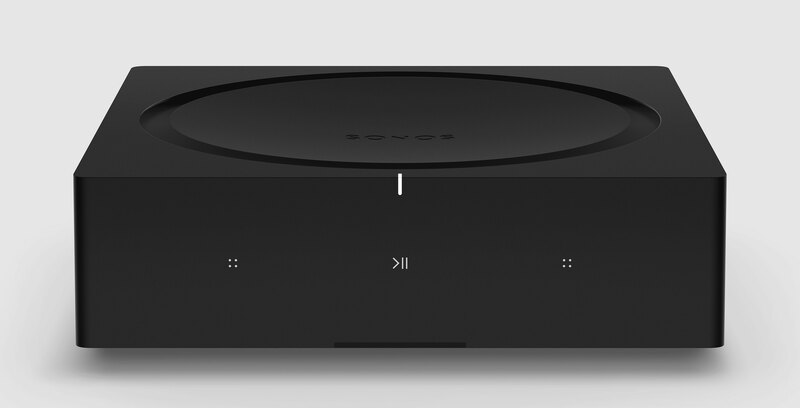 In addition to new hardware, Sonos is announcing a new program that will let any software developer create for the company’s platform. Previously only select developers were invited to use various APIs and integrate Sonos within their apps but starting in September any developer can log on the website and receive tools such SDKs, APIs, helpful documentation, Sonos Sound Experience guidelines and the ability to give direct feedback to Sonos. “The rise of the smart home, streaming services and voice interaction has really allowed a wave of users to be using smart speakers in their home,” Lidiane Jones, Sonos’ vice president of software product management, told media during the Boston event. In September, the platform will give developers new APIs for things such as core playback controls, grouping, play mode, line-in switching, volume pass-through, maximum volume limits and access to music playlists users create within the Sonos app. Meanwhile, coming in October will be a feature called Audio Clip, which is essentially a notification API that will let developers insert a sound after pausing the audio and then resume it afterward. Also coming in September will be IFTTT integration for sets of tasks. One hypothetical example given was a geofence so the platform will know to play a specific Sonos playlist when you come home on a specific day of the week or after a certain time. Sonos’ platform-agnostic approach to its physical products has already created an ecosystem that is compatible with many different services and operating systems. The company is hoping that by making its platform open to everyone in September will mean all developers, big or small, will start creating for it and make it much more useful and creative. “Launching something that’s open also becomes an accountability to Sonos because we are going to be publicly updating and delivering new APIs,” Jones said.